Saving wildlife is something that everyone is interested in today, indeed some are passionate about the subject and rightly so, given the increasing numbers of endangered species on the planet. We would like to think that we play our part in this, albeit a relatively small one with our security systems used by zoos and wildlife parks to protect their often rare animals and birds against theft, attack and vandalism. You can read more details on this by visiting our Wildlife Security blog post from back in 2009. Lions figure amongst the animals in a wildlife park where our systems were installed so it was with great interest that we read a fascinating news article this week - about how a white lioness was saved by, of all things, an electric fence! To see a white lion is in itself a rarity and for a photographer to have the opportunity of 'snapping' one close up is even rarer. Add into the equation the drama of a fight amongst rival lionesses and you have something extremely rare! 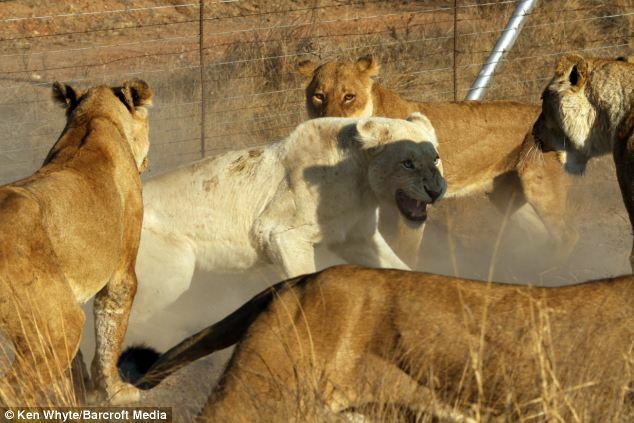 At the Kruger National Park in South Africa, game ranger Ken Whyte had his camera available when he saw a white lioness, who had become separated from her own pride, attacked by 5 lionesses from a rival pride. It looked as if it would be the end for the rare white lioness until one of her attackers brushed against part of an electric fencing system. The lioness jumped back in shock and in so doing distracted her co-attackers for an instant, allowing the white lioness the chance of a quick escape .... and escape she did. With apparently only minor injuries, she fled back to her own pride. We have always said that electric fencing can be an effective deterrent - but usually it's against human activity, not wildlife brawls! Click here to read the full story and see the series of Ken Whyte's amazing photographs of the white lioness under attack before her incredible escape. Interested in learning more on how to help save wildlife? Visit the WCS website. Interested in learning more about effective electric security fencing? Visit our electric security fence page which also offers a video presentation and pdf download.